Good morning fellow die cut crafters! Vicki here to share some summertime inspiration with you. Summer began a few days ago and that means beach time! I love walking on the beach both in the early morning and late evening. This card was created in my favorite square format of 5 1/2" x 5 1/2". I found some very old Worldwin embossed cardstock in my stash that was perfect for the water background. The net was cut from gold matte paper. I think this is going to be on my list of favorite die cuts. It is so awesome! 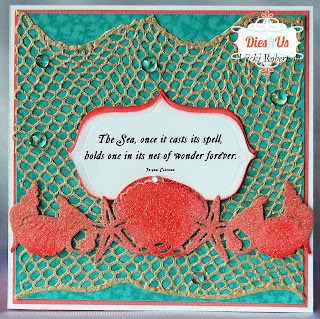 The seashell border is cut from the same coral cardstock that I used as matting for the background and behind the sentiment. 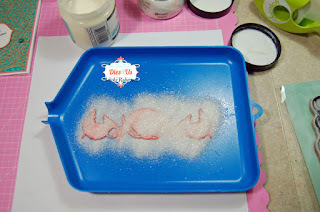 I added some color and sparkle to the seashells with distress inks and clear rock candy glitter. A few dew drops for water droplets and a pearl dew drop for the clam shell. Thanks for stopping by to share my "sea" inspiration. I hope I have inspired you to create with die cuts on your projects. 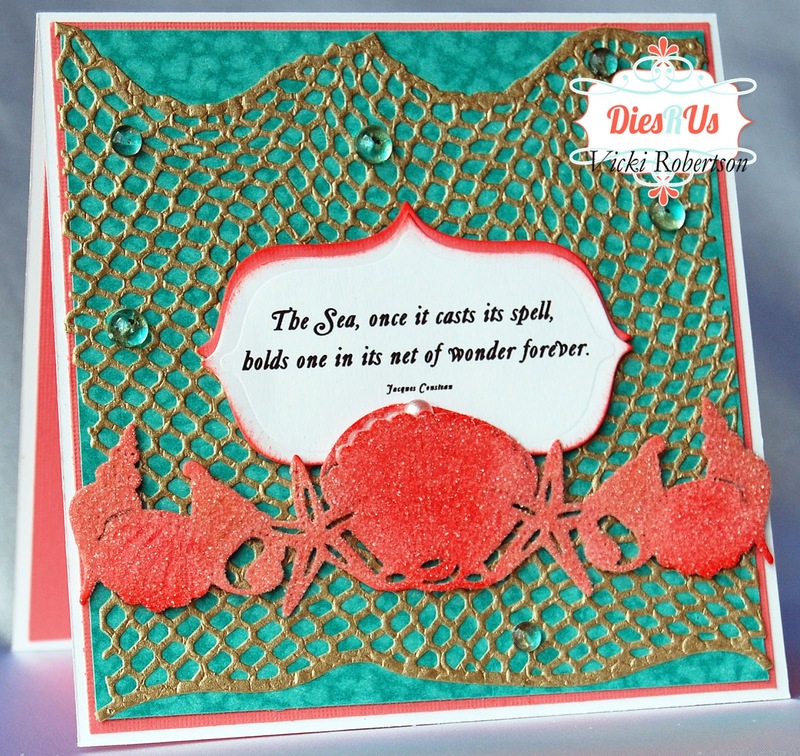 Visit the Dies R Us Store and browse their amazing inventory of available dies. 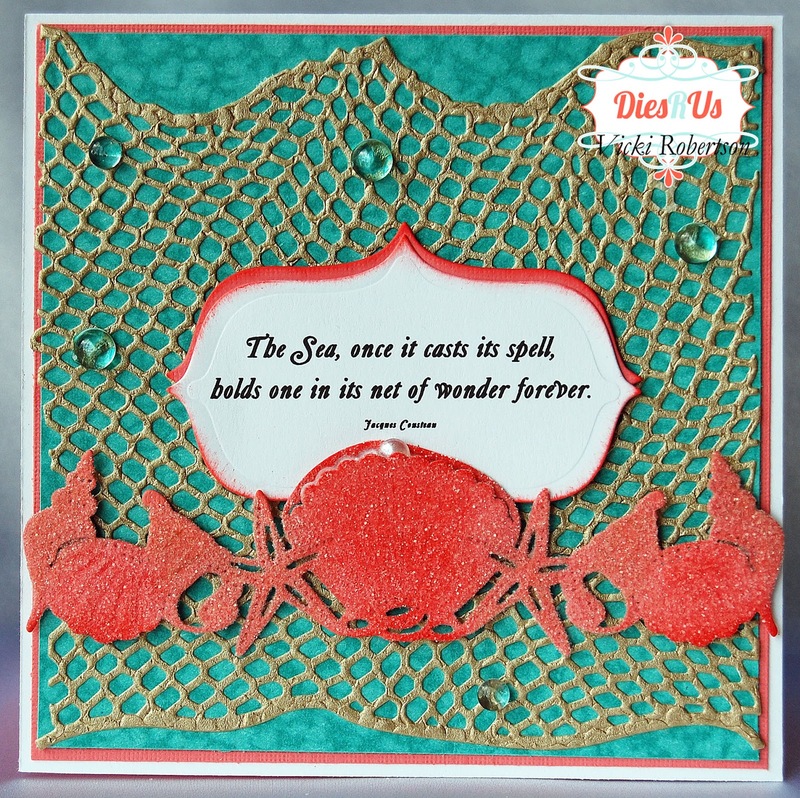 Love your sea-worthy card! The net die cut is awesome! This is awesome! 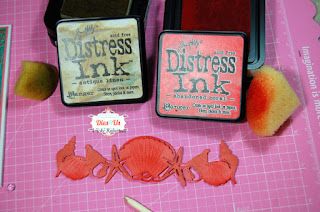 Love your design and now there are two more dies being added to my wishlist! LOL Great inspiration and wonderful tips ... thanks! This is so fabulous! How have I missed that awesome fishing net?? Off to add it to my cart! Oh my word, I need this net in my collection. What a great sea card! This is super cute and creative! That net die cut is awesome! I also wanted to say thank you for commenting on my blog the other day and giving me words of wisdom. I haven't quite decided what to do about the blog...it's hard to walk away from and it's hard to put all the time and work into it. I do enjoy it, however. Anyways, I just wanted to say thank you. Wonderful card and inspiration ! oh my goodness! this is just breathtaking! I love the elements! Saying Good-Bye and Hello . . . Pretty Vase of Flowers for You! Wishing You Happiness . . .